National Ice Cream Day is right around the corner, and if you are eating Paleo diet, we don't want you to miss it! 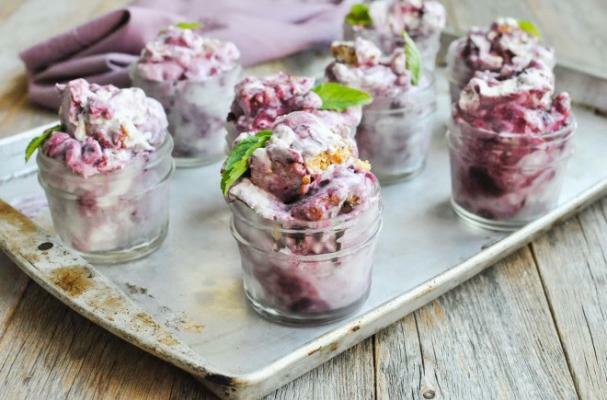 This Paleo friendly ice cream is based on coconut milk and honey (yes, please) with blueberry jam and cashew cookie crumble. One bite, and you will fall in love-hard. It's rich and creamy like the most decadent ice cream you have ever tasted. From the creative kitchen of Cassy Joy Garcia, author of the forthcoming cookbook 'Fed & Fit' (August 16th, Victory Belt), we can't wait to get a copy! Below, she shares how to make it all. - Bring all the ingredients to a simmer in a small to medium-sized sauce pan. Reduce heat, cover, and let it simmer for 30 minutes or until most of the berries have burst and it resembles a jam-like consistency. - Pull off heat and let it cool completely. - Preheat oven to 350 and line a large baking sheet with parchment paper. - Place the cashews, arrowroot, sea salt, and coconut sugar in a food processor and pulse until the cashews are mostly broken up, but you can still see some chunks. - Add the butter and pulse the food processor until it's pretty evenly combined. - Pour the cookie dough out onto the parchment paper and flatten into one large cookie. - Bake at 350 for 12-13 minutes, or until it just starts to turn golden brown. Remove from the oven and let it cool completely. - Once cooled, break the cookie up into large chunks and set aside. - In your blender, blend the coconut milk, vanilla, honey, and dissolved gelatin together until smooth. - Pour the mixture into your ice cream maker frozen bin and follow the manufacturers instructions. - In a large bowl, add the ice cream to the cooled blueberry jam and broken cashew cookies. Give the mixture 4-5 stirs (or folds) and try to resist over-mixing. Spoon this into a loaf pan and freeze for about 1 hour. - From here, you can either serve and enjoy directly or spoon it into small serving bowls. -If you're preparing to enjoy at a later time, freeze the small bowls and then about 45 minutes before you plan to enjoy, place them in the refrigerator so that they may soften a bit.